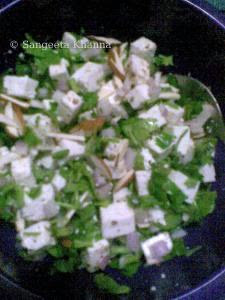 cube the cottage cheese and mix and toss with all the other ingredients and serve at room temperature.........it is worth mentioning here that i use all the thick stalks of coriander leaves as it is rich in fibre and full of flavour....many people are unaware that the stalks have more flavour than the leaves . one more important fact is worth mentioning that the cottage cheese available in the market has higher fat content.....the one having 25% fat has 309 Kcal/100 gm...........that makes it a high calorie salad , but if homemade paneer is used, it can be made low calorie........if we use skimmed milk to make cottage cheese at home, the fat content would not exceed 5%, and almost 1/3 of kcal.......now you can choose what you want. cottage cheese can be made easily at home. heat the milk and just when it is about to boil..........add a few tbsp of curds or whey or diluted vinegar or lime juice......all these give good results........the only thing which has to be kept in mind is that the milk should not be at boiling temperature, that's why just before boiling the curdling agent is added or if the milk starts boiling , let it cool first for a while then add curds.......and stir the milk so that it starts curdling ...more curds can be added but no heating after this..............the idea is to prevent immediate curdling of milk, which may make a hard cheese............at 96-98 C temperature, it will take 1-2 minutes to curdle........now pour the curdled milk over a sieve and let it rest for a while, then take it out in a bowl or a square dish...let it cool and it is ready to be cut and used. for diabetics leafy green salads salads these foods helped me loose wt.